I wake up at 4:15am every morning, to coach at CrossFit Oregon City. Breakfast is usually pretty simple- leftovers from dinner, a leftover frittata, or scrambled eggs. I love eggs and eat them pretty much every morning, but Monday I wanted to switch things up a bit. Though I've done so plenty of times in the past, I've discovered that Paleo-ifying treats (i.e. waffles, breads, muffins...) can be just too dangerous for me so I tend not to do so. But, this creation takes all of the ingredients (plus a little baking powder and coconut flour, for a little added substance) that I would normally throw into a frittata, blends them, and cooks them into a tasty little travel-friendly meal. I'm hooked. Blend ingredients in the blender (I just use a cheap Hamilton Beach blender, so any blender should work) until smooth. Pour batter into a preheated, greased waffle iron** and cook according to your waffle iron's directions. *The spinach wasn't in my original concoction, but was added today to get a little bit of green in me. I didn't really taste it, but also didn't let my waffles cool at all...the flavor may be more prominent as the waffles cool. **My waffle iron held all of the batter, but each iron will be different. I ate the waffles with my hands, but you could serve with maple syrup, sliced strawberries (or other fruit) if preparing the sweeter version. Serve folded around lunch meat and arugula for a savory meal. Either way, this recipe is super easy and tasty. These look awesome! I would love to try these wrapped around some Applegate Farm's ham. I pinned this one! These are REALLY good with some organic salsa on top!!!! How many waffles did this make? Also, can you use canned sweet potato for this? 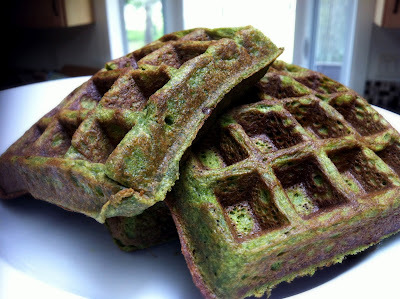 I've been looking for a new way to shake up my same ole pumpkin protein pancake recipe! ps I'm in portland, I just realized you're practically a neighbor! I've been wanting to try cross fit but am totally intimidated. Argan oil has the effect of making skin firm and generating wrinkles on the outside surface of the skin.To get more information about it please visit Buy Argan Oil for Skin and it give you the best treatment what you want.Thank you. Just made these and they are great! and EASY! I used canned pumpkin instead of roasted yam.